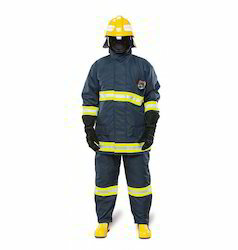 We offer our clients with Nomex Fire Suit that is use to prevent and secure from the fire. Moisture Layer: 50% Nomex®/50% viscose coated PTFE membrane. Thermal layer: Carbon felt laminate with 50 % Nomex 50% viscose comfortable face cloth. Double closed front, Velcro fixing device and safety zipper. Double super large pocket on the frock and pants, one radio pockets on the chest and a Concealed paper pocket between double close fronts. Cuff can be adjusted by Velcro and with fireproof, waterproof and thumb ring design. Extra patches shall be placed to the bottom of jacket's arms to increase the movement capacity. The reflector bands shall be sewed as rounded to the cuffs, foot, chest and the back parts of the jackets. Wasit of the trouser shall be higher at least 30 cm than jacket's foot. Elastic girdle and Elastic suspenders shall be easily opening-locking and adjustable clips. The sewing thread shall be meta-aramid. Looking for Fire Safety Suit ?